We know that every restaurant, club and pub is unique and will have distinctive needs. For example a ‘real ale’ micro pub, an Indian take-away, a vegan restaurant and a working men’s club all have similar but different requirements. At Prizm we think that a one size fits all approach is just plain wrong. We are expert insurance brokers and using our vast experience of your sector we will tailor an individual policy to the specific requirements you have for your pub insurance, club insurance or restaurant insurance. Late licence? Not a problem! Unusual Construction? Not a problem! Previous Financial or Criminal backgrounds? Usually not a problem! An insurance policy for this area of business usually has certain basic sections of cover which can be added to depending upon the way you operate. For example; most businesses, and pubs, clubs and restaurants are no different, will need to cover their assets against loss or damage; the business will need to cover their earnings if they can’t trade – and most importantly of all, they’ll need to cover their liabilities in case a member of staff or a member of the public gets hurt or something gets damaged. You will need to cover the buildings (if they are yours) and/or the shop front and/or tenants improvements (which is whatever has been spent inside the property on the fabric of the building) plus the stock and the fixtures and fittings. The cover will usually be against risks such as fire, storm, flood, theft, vandalism, impact plus less common risks such as earthquake, aircraft or lightning. If something happens that causes damage to your property, you can also cover your pub, club or restaurant against the profits you lost because you couldn’t trade. This can also cover you losing profits if your gas supply or electricity cable gets dug up or if they find an unexploded bomb from World War II in the carpark next to you (this happened in Birmingham in 2017) or someone gets attacked and dies inside your doorway! Put simply this insurance covers the theft of cash. But we must point out that you will not be covered if you have not taken sensible precautions. For example if you leave £50,000 in cash in the boot of your car and this is stolen do not expect any sympathy from your insurance company! Money insurance can also cover assault, so it would pay a (small) benefit if someone got hurt during a robbery. 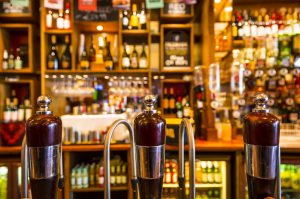 To most people it will be relatively obvious and essential that pub, club and restaurant insurance needs to have glass breakages as part of the cover. This would cover the cost of boarding up and replacing broken windows and signage. Sanitary fittings can also be insured against damage. As experienced insurance brokers this is the element of pub, club and restaurant insurance that we think is the really important one. This section covers Employers Liability (this covers your business should a member of your staff get hurt and then sues you); Public Liability (this covers someone who isn’t a member of your staff that is hurt and sues you – for example a customer falling over) and Products Liability (in case something you supply hurts somebody. This could be especially important, but not limited to, a business that serves food because as an example Liability Insurance will cover you if you fail to mention a product contains nuts). You need big levels of cover for these kinds of claims as legal costs alone can hit six figures, let alone any payment that you may need to pay to the injured person. You can also add to the basic insurance cover by including cover for Goods in Transit which may be especially important if you run a take-away, Terrorism, Theft by Employees (also known as fraud), Frozen Food deterioration, Legal Expenses, Cyber Liability Insurance and Loss of your Liquor Licence! Most policies that we would recommend have a 24 hours a day, 7 days a week, 365 days a year claims reporting line as, owing to the nature of the operating hours of pubs, clubs and restaurants, bad things often happen outside of the normal 9 – 5 office hours! Business insurance is NOT compulsory but if something bad is going to happen, you need to consider who will have to pay for the consequences? You or your insurance company? Either way – the bad thing will still happen irrespective of the existence of an insurance policy! As society gets more litigious and business has to deal with more and more regulations it is increasing sensible for all types of company to purchase insurance and we can cover hundreds of different trades and business types. Just call us and we can advise you. We are proud that we do business in an honest and ethical manner. What makes Prizm different from most insurance brokers is that in almost every case we don’t take a commission from the insurance companies for placing the business with them. What we do instead is charge our clients a fee. You as the client will see that our earnings are completely transparent and you can be assured that our recommendation for your pub insurance, or the insurance for your restaurant is not in any way influenced by commission offered by insurance companies. Since 2006 we have been providing expert commercial insurance advice to our wide range of business clients throughout Staffordshire, the West Midlands and beyond. Our offices are in the small town of Tamworth and you are welcome to pop in at any time. For pub, club, restaurant or take-away insurance please call us for all your insurance needs and enquiries. You can always be assured of our expert advice and knowledge of your business sector. You can request a quotation or arrange a call back.